The greatest risk of failure for new businesses has largely been found to be in their first year. Considering that many of these businesses are launched by first-time entrepreneurs without significant experience and limited funds, this isn’t necessarily surprising. What may come as a shock is that the next most dangerous time for a small business is several years later, after it has already established itself and proven its viability to potential investors. Approximately 4 years after launching, many entrepreneurs start looking to realise the growth potential of their now stable business. Unfortunately, expansion is risky and expensive, and business owners who don’t approach it with the planning and foresight it requires frequently find themselves sitting in the ruins of what used to be a promising enterprise. Many inexperienced entrepreneurs start businesses without a thorough business plan. More experienced startup owners, on the other hand, often plan out the launch of their business, but then fail to create a thorough growth plan for when it’s time to scale their business up. Attempting to do this is like flying blind, and can very easily lead to catastrophic problems. Entrepreneurs need to take the time to sit down with experts in their organisation and from their financial institution to create a thorough and realistic plan for their business’ future, and to determine the feasibility of that plan. Before you can start to grow, you need a clear picture of exactly how you’ll grow your business, what it will cost at what times, and how long it will take to recover your investment. Expansion is expensive, and often takes months or years to pay for itself. A successful startup might be able to dedicate a large budget to growth, and have access to significant additional financing, but still be vulnerable to financial destabilisation during their big growth phase. One of the most common mistakes that business owners make is to set unrealistic expectations for revenue growth, often without making any contingency plans for when those expectations aren’t met. When projected revenues don’t materialise, those businesses find themselves overextended and unable to cover their costs. Even those who aren’t forced into bankruptcy over it might still be forced to make painful and damaging cuts to stay afloat, compromising the longer term stability of their business. Even businesses that grow strategically, while avoiding unnecessary risk, face a wide range of potentially destabilising financial hurdles. Funds that are being funneled towards growth are necessarily not available to smooth over everyday cash flow issues like late client payments, equipment breakages, and countless other types of unexpected expenses. To deal with these businesses need to turn to other solutions. A good way to handle this is to use short term financing tools like invoice financing,supply chain finance, and unsecured business loans to free up additional funds nearly instantly. This allows business owners to focus on executing their growth plan without spending huge amounts of time and effort chasing late payments and keeping their working capital stable from one day to the next. A very serious issue that business owners don’t tend to be aware of until it happens to them is a growth-related plunging business credit score. After a few years in business, small enterprises have generally established themselves and had enough time to build up a great credit rating. However, when it’s time to grow, they shop around at a variety of financial institutions to come up with the financing they need to fund their newly minted growth plan, often submitting applications at each institution. This is dangerous, because each of these institutions then performs a credit check on the business, negatively affecting their credit score. This depresses the score of an otherwise financially strong business, and makes it more difficult for them to access financing going forward. Worse, this credit slump would be most pronounced while the business is executing its growth plan, and is most vulnerable to unexpected financial disruptions. Businesses who can’t get the financing they need to deal with such disruptions might find themselves unable to pay off other financing, leading to further credit enquiries, and an even more depressed credit score. Growth isn’t just the natural result of a well-run business. Scaling up requires just as much care and foresight as getting a business into a position where expansion is possible. 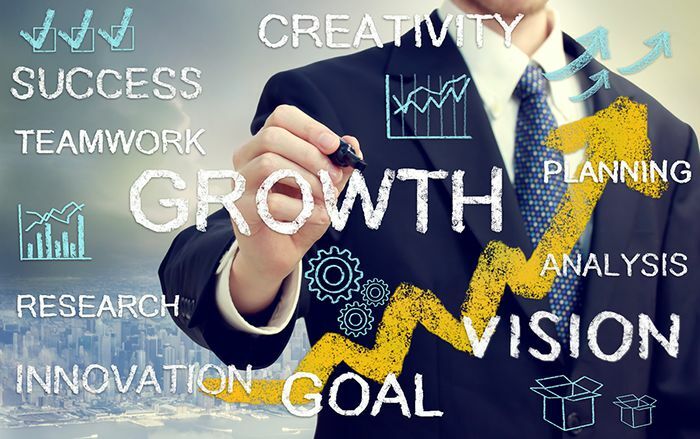 By devoting the time and resources to develop a thorough growth plan, and taking steps to keep finances stable and financing accessible during your growth phase, businesses can help to make sure that they don’t become just another statistic.